This Excel assignment is intended to give students practice on calculating work, force, distance, power, and time. Expires 6/2020. Students should have covered or have a reference to the equations relating the above factors. 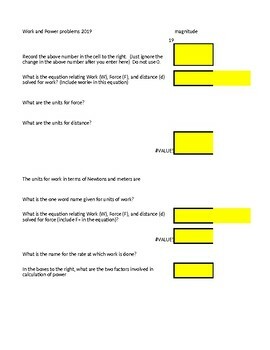 The assignment then gives each student a unique set of problems to solve for the various factors when the other factors are known. Therefore, while students can help each other, students can't simply copy each others answers. 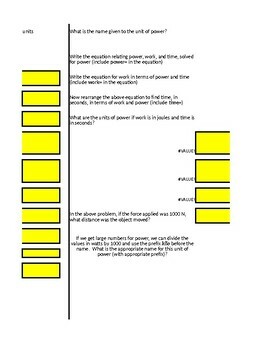 The student needs to fill in the yellow cells with their responses. If the student's response is correct, the cell turns green. The student then gets immediate feedback. If the cell turns green, great. If it stays yellow, no harm; just figure out what went wrong and calculate again. As a teacher, I find that this exercise is different enough from paper and pencil assignments that students are more engaged. Students want the answers to turn green. Maybe they like the cells turning green, or they just don't want their peers seeing the yellow. The teacher can also easily see from across the room which students are progressing and which students are struggling. I typically assign this using google classroom to distribute, but students do have to open the file in Excel. Google sheets doesn't conditionally format like Excel, and so opening the file in Sheets won't allow the answers to turn green all the time. It takes awhile for the students to get comfortable opening the files in Excel. I have multiple assignments like this one for a variety of science concepts, so my students are comfortable with this. When the student completes the assignment, they save the file and attach and turn in through google classroom. I feel this is also good practice at having students get used to digital assignments and turning assignments in electronically. I have used this assignment from 8th grade science, high school physical science, and physics.